Here's the obsidian I have going in one of my 3-pound barrels. I think it's been in course for around three weeks, maybe half of it still has some pits and cracks that I don't like. I started it in pea gravel but switched to ceramics about a week ago. I'm wondering if I'm just being impatient or is this a usual amount of time for the first stage with obsidian? It's strange, but the slurry in the three pound barrels seems to be runny and the slurry in my six pound barrels is super thick. I keep adding water to the six pound barrels. Should I thicken the slurry in the three pound barrels? I know there are no exact answers due to variables (like how full the barrels are, the rock/tumbling media ratio, etc. ), I'm just looking for general help. Anyway, here's the pic, thanks for looking! Ok, thanks. One more question, remember I'm still pretty new at tumbling. I'm trying to decide if I should remove the few pieces that I think are ready and replace them with more ceramics or some of the agates I have waiting. To my eye your stones are nicely shaped and well-rounded. If you have access to a grinder I would take whatever flaws are left off with that (I used an 80 soft wheel) and move them up to the next grit. Are you planning on finishing them in the rotary? I started mine in a rotary and finished in a vibe (UV-3). You could also take out what is ready and refill with ceramics for volume and just keep coarse tumbling until the flaws are gone. This will take longer and reduce the overall size of the stones more than just hitting the flaws. My slurry was also thicker than what I see in your barrel. I think I was adding 2 Tbs of clay (kitty litter) to the barrel when I charged with grit. Most of them are shaped and rounded well except for a few minor cracks or pits. If I didn't have such great tumblers here on RTH to compete with I'd consider moving them along. But I can't have imperfect end products, can I? Sadly all I have for now is two rotary tumblers. I'm going to check them in another week and see where they're at. I don't have a grinder yet, just a dremel. But I'm not sure the flaws are bad enough to warrant grinding them down. I think I may have to add some cat litter, manofglass suggested that as well. Like I said, the grit in my six pound barrels is way thicker- almost like pudding. Just keep in mind that obsidian can also continue to have pits throughout. You will want to pull the good ones as they shape well and then continue the ones you are not happy with. 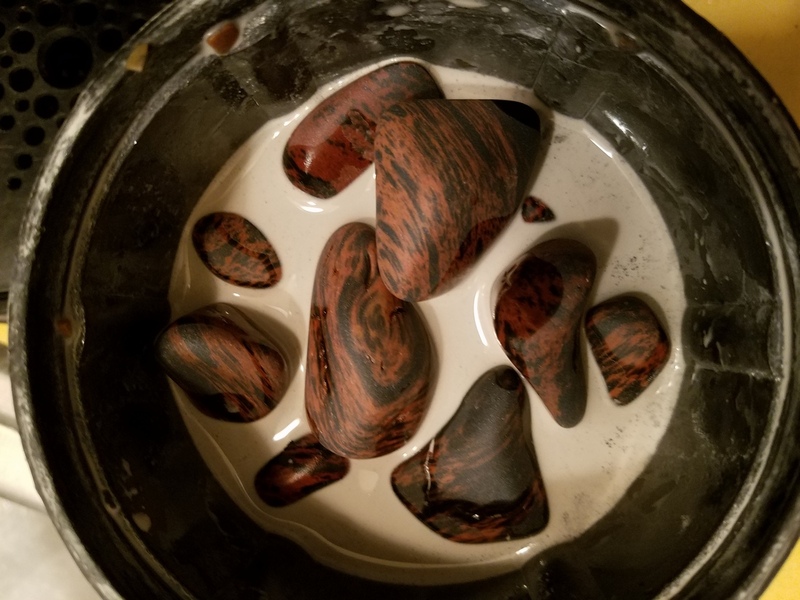 Obsidian is softer than agates so mixing them can be a problem in later stages. I find glass filler works well with obsidian because it is the same hardness and all silicates. just keep the barrels about 3/4 full at all times or you will start breaking them instead of rounding them. Ok, thank you for the information. It's my first time working with obsidian, but definitely not my last. I put 25% Obsidian to 75% ceramic pellets. Roll two weeks for each stage..
For polish, I ran the Obsidian till it took a good polish, changing the charge once a week.. Took about three weeks for polish..
All done in a rotary, because most said it couldn't be done.. Thanks. Since I have the obsidian and all I have is a rotary that's what I'll be doing it in. I think it will turn out fine. I've learned a lot about patience since I started hunting and tumbling. And I considered myself to be a very patient person before- but this is a whole new level. Many of mine (obsidian) run longer than 3 weeks in rough in a 3lb barrel. I do use agate smalls (roughly 1/4-3/8 inch) because I have an endless supply, and it seems to speed things up a bit. Getting a good slurry with obsidian is difficult for me, probably because I'm lazy and imprecise. Based on all the discussions about clay, I was able to obtain some free pottery clay, adding about a golf ball-sized amount to a 3lb barrel seems to speed things up as well. I also cut back quite a bit on the amount of water I use.